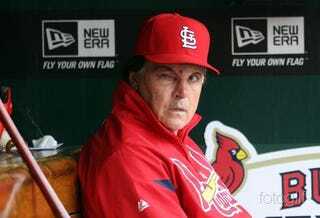 La Russa "retired" after winning another World Series in St. Louis, but he may not be done. Like many retirees, he's seeking the warm weather and easygoing lifestyle of Southern California: La Russa could be a big part of the new Dodgers regime, if that team ever gets sold. Hedge fund manager Steve Cohen's is reportedly the frontrunner among the four prospective ownership groups vying to purchase the Dodgers, and he's already started assembling a staff. Cohen met with La Russa over the weekend, reported to offer him some kind of management role—head of baseball operations, say. Cohen's front office would already include longtime agent Arn Tellem. For perspective on the race to buy the Dodgers, we turn to Larry King, who for some reason was part of one of the failed bids: "This has become a vanity purchase. Where are the baseball people?" Where are the baseball people, asked Larry King.